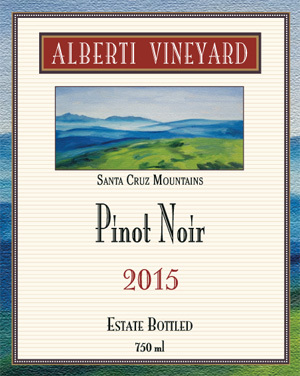 The Alberti Vineyard label design was a creation of Jim Alberti. Alberti has been active in the graphic field for 25 years and has participated in many corporate marketing campaigns. 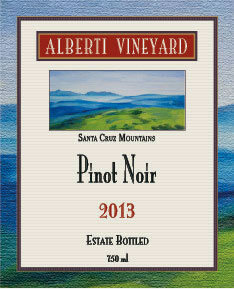 The front label image is a view of the Alberti Vineyard looking Eastward	toward the Santa Cruz mountains Summit area. The back label has the Appellation of Origin and other descriptors describing the location, elevation, and plant descriptions of Pinot Noir in the vineyard. Also on the back label is a brief historical facts paragraph.